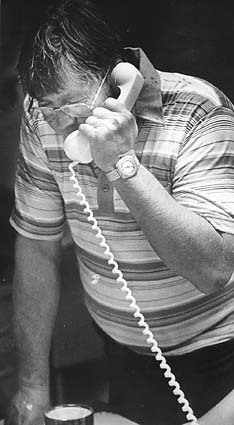 Grand Island Mayor Bob Kriz was about to take a swim in his backyard pool on June 3, 1980, when his portable beeper went off, calling him to City Hall. There was nothing unusual in that. It's standard procedure for the mayor and city department heads to be called to the emergency communications center whenever severe weather threatens the area. Often the storm clouds pass by with no damage at all. That was not the case on June 3, when routine storm preparations turned into perhaps the most violent night in Grand Island's history. ''I proceeded to the center and all hell broke loose,'' Kriz said. Fortunately, Kriz's instincts were right in one respect. Even though there was widespread destruction, only five people died. But Kriz said he initially heard rumors of ''bodies strewn in the streets.'' Officials remained concerned about the possible death toll for several days, until cars that had been blown into water-filled detention cells could be checked, as well as other areas that might have hidden bodies. Kriz remembers one wrecked building where people kept smelling something bad, only to dig into the rubble to find dead chickens. Kriz said city employees ''did an excellent job'' both during the tornadoes and in the aftermath. But they performed no more heroically than the citizens themselves. ''The tornadoes reaffirmed what I thought about the strength, the courage of Midwestern people,'' Kriz said. Kriz, who said he got along well with the local news media, had a different opinion of the national media. He said some national reporters seemed most interested in finding some way to embarrass President Jimmy Carter when he visited Grand Island after the tornadoes. Kriz said reporters found out he was a Republican and tried to use that as a wedge to question him about what he thought Democrat Carter's ''real'' motives were in visiting Grand Island during an election year. Carter promised that the federal government would do whatever it could to help Grand Island recover, and today Kriz believes Carter lived up to that promise. Kriz also believed that politicians, federal or state, did not like to be embarrassed or criticized. With Grand Island residents hurting, Kriz said he believed his talk about the state showing as lack of compassion would help bring about a speedy response from government. However, Kriz's talk was not just a calculated move, according to former City Administrator Dwight Johnson. That made Kriz's indignation genuine, Johnson said. In the end, Kriz said he was pleased with how much money the city got from the federal and state governments. Numerous state and federal politicians and many private groups provided help to Grand Island, and Kriz said he is hesitant to start naming names because someone is sure to be left out. However, one name Kriz does mention is the late U.S. Sen. Ed Zorinsky, D-Neb. Kriz was impressed with Zorinsky partly because he never sought the spotlight to advertise any help he might be giving Grand Island. Johnson said that ability to listen to people and take good advice was one of the strengths Kriz brought to the disaster. In retrospect, Kriz's responsibilities came in several phases, Johnson said. There was the night of the tornado itself. Kriz also looked at the intermediate and long-range needs in agreeing to set up citizen task forces in areas such as mental health to deal with the recovery, Johnson said. Those task forces also formed an organizationa l structure for keeping everybody informed. Sinor said Kriz's self-confidence was a boon. ''He had the confidence to deal with the governor, senators and president in coordinating efforts on disaster relief,'' he said. Help also came to Grand Island from people outside the community. Kriz said he was astounded by the generosity shown by hundreds of organizations and private individuals who sent money to Grand Island to help with the relief effort. One gift was particularly surprising. ''One lady sent two stamps and said that was all she could afford,'' Kriz said. Kriz said the tornadoes ''put Grand Island on the map.'' Because he was mayor at the time, Grand Island's fame brought celebrity its top elected official. When Kriz said Nebraska, the man asked, ''Grand Island?'' Then the man knew Kriz was mayor of the town that had been hit by the tornadoes. The tornadoes' long-term effects on Grand Island are hard to gauge. Kriz said he soon realized when he visited elementary schools after the storm that the best thing he could do was just listen. Kriz said he sometimes meets older teens who might have been only 8 years old at the time of the storm who ''still have a horror'' of what tornadoes can do. But no one is permanently bowed by the destruction that occurred that night. Kriz said many people not only used insurance money to rebuild their homes, they dug into their own pockets to build that addition they always had wanted. Business people on South Locust agreed to additional zoning requirements for signs and landscaping so the street would be beautified as it was rebuilt, Kriz said. Some scars and reminders remain, such as the young trees that replaced the huge old trees in parks, Kriz said.